1. 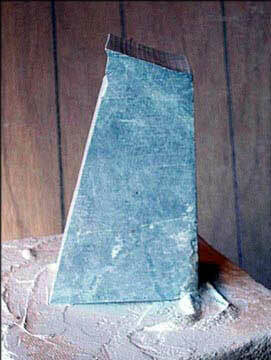 By my buying my soapstone directly from the mine "Les Pierres Stéatites Inc". in large slabs (75 pounds plus), I am not limited to restricting my ideas of what to carve. This often results in smaller odd shaped pieces of stone being leftover. For this carving I chose one of these odd shaped pieces of stone that was on my leftover pallet. I could see that it would fit the shape of the carving I had in mind. 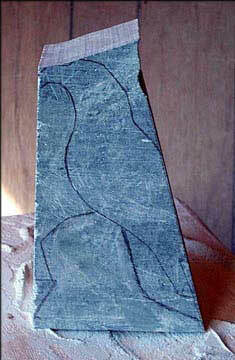 The piece of soapstone I am using for this carving is 7 1/2" high by 5" wide by 2 1/2" thick. 2. On the linked page is the eagle pattern I used for this carving. The pattern is designed for a 2 1/2" wide piece of stone. If you plan your sculpture to be larger, you can use your computer to enlarge the pattern. 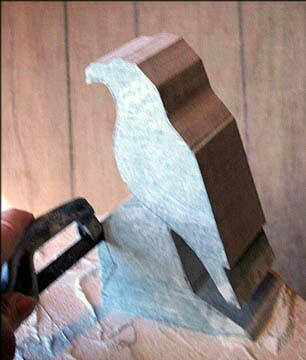 I have published only the basic outline for the eagle, this allows you be creative with the base. This pattern I am using is 6 3/4" high. I will use the excess stone at the bottom to create the base.If the stone had been taller I would use the extra stone to give a greater height to the sculpture. I am planning for a craggy rock base for my carving, so the lines I am using for the base are very geometric.